Image: NASA Earth Observatory images by Joshua Stevens, using Landsat data from the U.S. Geological Survey. 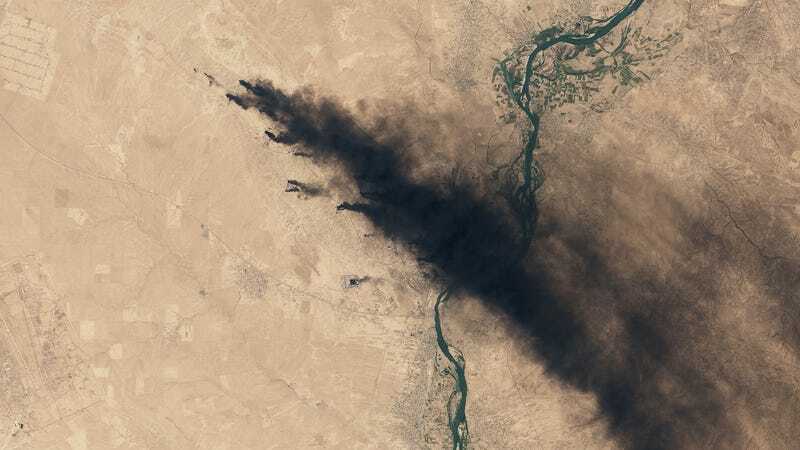 A camera aboard the Landsat 8 satellite has been tracking the progress of oil fires in Iraq that have been burning since June. The dark plumes of smoke, which are wreaking havoc on local communities, are a stark reminder of the ongoing war in the region. The dense plumes of smoke are emanating from multiple sites about 30 miles (50 km) south of Mosul. The fires were deliberately set by ISIS militants before abandoning the city earlier this summer. The smoke has been persistent over the past three months, blotting out the sun hours before nightfall. These oil fires bear a striking resemblance to the blazes set in Kuwait during the Persian Gulf War in the early 1990s. Iraqi troops ignited more than 700 oil wells during their retreat, prompting fears (which proved to be unfounded) of a “nuclear winter” effect at the Earth’s surface. The fires in Iraq aren’t nearly as bad, but they’re still cause for concern. As noted by Ralph Kahn, an atmospheric scientist at NASA’s Goddard Space Flight Center, the fires are producing noxious, grayish-white smoke palls, fueled in part by the high salt content from the briny substrate found in this desert region. Factors like humidity, wind, and fuel density are also affecting the plume’s constitution and color. Until these fires are extinguished—and it’s not at all clear when that might happen—local residents will have to deal with the smoke and its effects. The region reeks of petrol, and many residents, including children, have developed coughs. Just a few minutes of exposure causes a burning sensation in the throat. Sadly, it could take months, if not an entire year based on the earlier precedent in Kuwait, before these fires are extinguished and the wells capped.